The gift of flight means different things to different people, but, for many, it’s simply an unfulfilled dream. You see these people at the airport (often with small children) poking their noses through the fence, just watching and wishing. However, for others, like me, this was the start of something special and, at a very young age, I decided flying was for me. My father also had the “bug.” When I was about six, he took me for my first flight in a rented Piper Tri-Pacer, but his dream of flying stopped at model airplanes. I, too, dabbled in RC in the beginning and during those times when I was not an aircraft owner. At one time, I had $10,000 in RC aircraft! Then, in 1971, I bought my first airplane, a Piper Colt, for $2800. Today, even $10K doesn’t go very far towards the purchase of a simple 2-place airplane. Sadly, the cost of flying has skyrocketed so much since then that many of the “dreamers” are kept from making flight a reality. Fortunately, if you’re reading this, there’s a good chance your not one of them. For those who do become pilots, some fly VFR-only for fun and relaxation. Others get their instrument ticket, but chose to use it sparingly in “light” IFR conditions—if only to get away from weather. Then, there are those who find the need or desire to spend more time in the clouds, so they’ve honed their IFR skills to where “medium” IFR and occasional approaches to minimums are a reality. We’ve discussed each of these situations, the pilots, and the tools they require, but here we’ll discuss the reality of “hard” IFR flying and flying for business. In this realm, state-of-the-art is king. There are no low-time “hard” IFR pilots that I know of. By nature of the work involved and the skills required, “hard” IFR is reserved for the experienced and the bold. Frankly, I’m surprised guidance counselors aren’t moving students towards a professional pilots career more frequently because “hard” IFR can best be described as the greatest “high stakes video game” out there. And, unlike Space Invaders, it pays well! Whether an active private pilot, a pilot flying their own aircraft for business, or a professional pilot at the helm of a corporate jet, the primary role of their aircraft is to get somewhere—but, getting there is not always “half the fun.” The active private pilot flies frequently and is confident in IFR conditions. On the other hand, the business flyer is frequently motivated by an appointment, (e.g. getting himself or the boss to a meeting on time). Through good training and experience, they’re qualified to do so. You can usually recognize them on the tarmac as they have that certain swagger about them. (FYI, a shirt with epaulets can get you halfway there!) Flying “hard” IFR in a Cherokee 140 from Boston to Miami is tedious, so they usually fly high-performance singles, twins, and jets; and, for obvious reasons, they pretty much stick with the latest and greatest avionics tools available. They’re the kind of pilots who were buying the GNS-430 before most of us saw a real return. If you really think about IFR flying as being analogous to a video game, you’ll realize that once you’re in the clouds all of your information comes to you from instruments and sensors that tell you where you are. Actually, “telling” was the way it used to be 20 years ago. Today, modern avionics available to the IFR pilot not only tell you where you are, but they “show” you as well. Instead of reading and interpreting dual VOR indicators and DME readouts, MFDs with amazing maps, PFDs (Primary Flight Displays) with Synthetic Vision, and a host of sensors show us exactly where the weather, terrain, and traffic is. You now need less time to interpret and have more time to fly. Today’s “hard” IFR panel will usually contain all or most of these tools with an additional emphasis on redundancy. Let’s start at the top of the panel and work down. In years past, audio controls designed for business use had features not found in your typical GA audio panel. However, thanks to companies like PS Engineering, the technology available to GA today has caught up. Once your airplane is equipped with multi-comm capability, automatic intercom squelch, and split-transmit capability (allowing the pilot and copilot to communicate simultaneously), just add digital recording, entertainment, and cell phone interfaces, and you’re pretty much master of your audio environment. Plus, all of this is now found in a compact, fully-integrated unit. First UPS and now Garmin have gone a step further. As Garmin increased the size of their integrated units (specifically the GTN-750 and the extra panel space required), they now offer the ability to remote the audio panel. Since “hard” IFR panels are frequently crowded, this is a nice option. You’ll typically find one of these state-of-the-art audio panels (either panel- or remotely-mounted) in a modern IFR panel—especially if the role is “hard” IFR. Enough said! In some cases, redundancy is taken to the extreme in panels designed for this type of flying. Since, the “latest and greatest” equals integrated units – like Garmin’s GTNs and Avidyne’s IFD series (coming soon) – you’ll seldom find a self-contained comm in this panel (with the possible exception of an aircraft that has need for three comms). A significant differentiating factor in communications in this situation is transmit power. While this is usually a non-issue in most GA aircraft, aircraft flown for business commonly fly faster and higher. Consequently, if the crew spends a lot of time “on oxygen,” it’s best to consider higher output comms. Standard GA comms have an 8-10 watt output. To compensate for the additional range between aircraft and ground stations at higher altitudes, most manufacturers offer units with higher outputs (typically 16 watts). Such units are commonly found on turbine singles, twins, and, certainly, light jets. I’ve always felt that dual VOR/ILS and dual IFR GPS is a bit excessive for most IFR panels—even those flying “medium” IFR. In most situations, a reliable Nav-Com with VOR/ILS (with glideslope) is sufficient for backing up an integrated unit like the GTN-650 or 750. Dual integrated units incorporating dual VOR/ILS and GPS are common in “hard” IFR panels, as are the biggest screens available. In aircraft like this, you’ll find a lot of extra sensors, including approach plates, WX from multiple sources, as well as, traffic and terrain information. This calls for screens that are large enough to display all this information without clutter. In “hard” IFR, all this information must be easy to see and interpret. A horizontal situation indicator (HSI) is almost always present. Whether a standard Mode A/C transponder or one of the latest enhanced Mode S units, it’s not unusual to see them in pairs in this type of aircraft. Since 9/11, nothing will ground an IFR aircraft faster than a failed transponder. Consequently, pilots with a schedule to keep will frequently have two transponders on board. One Mode S and one standard A/C unit (for back-up) is not unusual. Since “hard” IFR pilots and those flying for business are always the first to invest in the latest technology, you will typically see Mode S and even ADS-B equipment installed in their aircraft. My advice for the “average” VFR or IFR GA pilot has been to hold off on an ADS-B investment. Conversely, the “hard” IFR crowd is always anxious to equip their aircraft with the latest tools. As with audio panels, Garmin now offers a remote transponder, standard A/C, and Enhanced Mode S to work with the GTN-750. It’s a great solution to panel space issues and provides for a very functional and slick package. If you’ve been paying attention, you know that I believe that any aircraft flown in IFR conditions should have an autopilot. An aircraft flown for business or in other “hard” IFR conditions will typically have one of the best—complete with all bells and whistles. While the VFR and “light” IFR guy or gal will find that a basic, coupled-wing leveler will do the job, two-axis capability (including glideslope coupling) is common here, as is vertical speed control, altitude pre-select, autotrim, and GPSS roll-steering. Twin-engine aircraft and some singles will frequently include a Yaw-Damper, which is essentially an independent third-axis unit that compensates for adverse yaw, providing additional comfort for passengers. Some also help in the event of an engine problem in a twin. The V-tailed Bonanza was, and still is, a great IFR airplane, but it suffered from yaw issues in bumpy weather and would frequently have a yaw damper installed. The bottom line here is consistent with everything we’ve discussed so far—a business aircraft or any aircraft flown in “hard” IFR conditions will usually have a state-of-the-art autopilot. Though the light jet market was already doing this some years back, the buzzword in avionics right now is EFIS (Electronic Flight Information System). New high-performance singles and twins coming out of Piper and Cessna are loaded with the stuff. Meanwhile, earlier models are being retrofitted with EFIS Primary Flight Displays (PFDs) and matching big-screen MFDs. The benefits are obvious. Since pilots in “hard” IFR want and need a lot of information in front of them and, usually, have the sensors to provide it, the large format EFIS units offer it all in a bright, easy-to-read, color display. 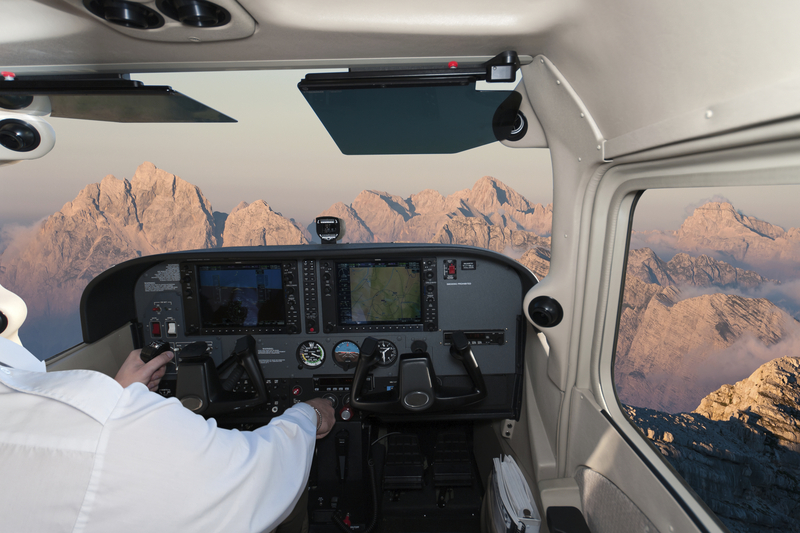 Synthetic Vision is one of the latest tools available to the IFR pilot, and EFIS PFDs make this a reality—even for the “light” IFR pilot. But, for the business flyer or anyone who frequently does IFR approaches in hard terrain, the ability to see the terrain situation on a screen in front of you is an amazing addition to an IFR panel—especially when you can’t see anything outside your windscreen! I’m reminded of the cartoon depicting two pilots sitting in the cockpit and looking out through the clouds where they see a mountain goat and ask, “What’s a goat doing up here?” With synthetic vision, you already have the answer and you can see the danger—well, everything but the goat! Now, let’s look at the information available on these EFIS screens and the sensors typically found on the “hard” IFR airplane. Radar: It’s certainly possible to see radar installed on twins, jets, and even some sophisticated high-performance singles in the form of a wing pod. However, it has always been my contention that the “average” IFR pilot has limited understanding and ability when it comes to operating a radar unit and maximizing its capabilities. In my opinion, the equipment has its limitations too. Radar measures precipitation and, simply stated, it reports the intensity of moisture in the air. Yet, turbulence and hail are not reflected. If you have color radar onboard, learn to use-it. However, if you want more accurate information on where the turbulence and hail is, I recommend a Stormscope for many reasons. First, if you don’t have radar now, the cost to install a modern, color radar system is very expensive—especially if you need or want a radar-capable MFD to display it. To me, the investment vs. the return on investment simply doesn’t add up. Frankly, there are very few radar options worth considering for a new installation. The King ART-2000/2100 and Garmin’s GWX-68 and new GWX-70 are it. You’ll also find that new is pretty much the only way to go. Second, if you’re trying to avoid turbulence and hail, why not invest in a piece of equipment that is designed to point you directly at their source—a thunderstorm cell. In other words, get a Stormscope! Stormscope: The Stormscope concept started in the early 1960s when a pilot named Paul Ryan (not the one in Congress) got caught in a thunderstorm. He noticed that when he saw a lightning flash, his ADF needle briefly pointed to it. Armed with that information and a passion to help fellow pilots get out of such a situation, he developed the first Stormscope. Since then, the technology has evolved. Today’s Stormscopes, like the WX-500 Sensor from L-3 Communications and the TWX670 “Color” Tactical Weather Detection System from Avidyne, are accurate and reliable. The L-3 WX-500 has been the dominant player for many years and plays on a wide array of MFDs and large-format navigators like the Garmin 400, 500, 600, and 700 series. It’s a great tool for cell avoidance. A few years back, Avidyne introduced the TWX670 predicated on the concept that “color is better.” While today’s color radar units are easier to interpret, note that the color “feature” is only available when displayed on their EX-500 or 600 MFD or their MHD300 (Multi-Hazard-Display). Frankly, I have more experience with the WX-500s, but the Avidyne offering is not to be discounted. Personally, I feel that a Stormscope (as a “defensive” tool) paired with Nexrad weather makes the most sense for active IFR pilots. Nexrad WX: The industry played with different methods of rebroadcasting Nexrad weather before finally settling on satellite delivery. The two primary sources are now WSI and XM/WXWorx. WSI appears to be the primary source of WX information for the major airlines and in airport pilot lounges. It’s even available in your aircraft using their AV300/350 system which is compatible on a number of EFBs, MFDs, and integrated units. WSI is also a source for ADS-B weather, but you’ll need ADS-B “In” to enjoy this “free” weather feature courtesy of the government. In my opinion, if you want the best available weather in “hard” IFR conditions, WSI seems to have the edge. On the other hand, XM/WxWorx became the choice for Garmin and is available on their panel-mount units (as an option) and on some of their portables as well. Avidyne also has the XM or WSI options available. Avidyne also offers their MLB700 system which utilizes the Iridium satellite system and provides WX and datalink capability on an international basis. Since Nexrad WX is a rebroadcast and is typically delayed by five minutes or so, (lightning information is frequently longer) the industry suggests you use it as a strategic, “planning” tool—not as a “defensive” tool. Its big advantage is its ability to see way beyond the scope of your on-board radar or Stormscope. This allows you to look ahead at your destination’s developing WX picture and plan ahead. Avoiding weather is pro-active—just use your tools to avoid potential trouble. Conversely, the problem with traffic is that it may be coming right at you and, unless you have the tools to be pro-active, a passive response can kill you! The key word here is “active.” In my opinion, at this time the only traffic tool that makes sense is an active traffic system. ADS-B will be an important tool as we approach the ADS-B “Out” requirement and once the “fleet” is fully equipped. But, for now, the only way to be sure you’ve maximized your protection against a mid-air collision is with an active traffic system. Once ADS-B is fully implemented, your active traffic system will work with your ADS-B unit for an even higher level of protection. So, if you’re considering an investment in traffic, don’t think that your purchase of an active system will be dated. Today, it’s the best tool for traffic avoidance; and, it will continue to be, as least, for the foreseeable future. L-3’s “Skywatch” system has been around for a long time. The same Paul Ryan responsible for the Stormscope went on to design some of the best traffic systems. Today, they’re known as the TAS Systems from Avidyne. By my standards, they look like the value leader, but Garmin too has their own GTS Series traffic units. Bottom line—they’re all active systems and great traffic tools! The need for terrain avoidance is directly proportional to where you fly. Certainly, if you’re making regular IFR flights to Aspen, CO, you should be concerned. On the other hand, if you fly in the Midwest or Florida, not so much. On the contrary, obstacles are another issue altogether and can be encountered anywhere—at low altitudes or, sometimes, considerably higher. For example, the U.S. Military operates (10) Aerostat Radar Balloons along the southern coast, including one over Cudjoe Key, near Key West, FL. This balloon is tethered at 15,000 feet by a single cable. I don’t know about you, but if I were in IFR or VFR conditions anywhere around there, I’d really want to know where that is! Terrain and Obstacle Avoidance comes in two versions: cheap or expensive. When UPSAT introduced the MX-20 MFD back in 1999, it was the first MFD for GA that offered built-in Terrain and Obstacle Warning technology. Now, it’s available as a built-in feature on some very affordable portable GPS units and is included in most of the MFDs and integrated units from Garmin and Avidyne, including their new IFD-540/440 units. Bendix King will probably catch-up one of these days too! On the expensive side, you have the certified Class A and Class B TAWS units now required in certain class aircraft for both personal and commercial use. Synthetic Vision, also available in affordable portables or in the more expensive integrated units and MFDs, has now taken terrain and obstacle avoidance to the next level. CFIT (Controlled Flight into Terrain) represents a significant percentage of the aircraft accidents these days and, when it happens, it’s almost always fatal. Any aircraft spending significant time in “medium” to “hard” IFR conditions should consider one of these options as required equipment. Few private IFR pilots have the luxury of a co-pilot or a flight engineer whose primary role is to monitor the condition of the engine(s). In “hard” IFR, with pilot workload already at maximum, it would be nice to have someone or something monitoring the engine. Today’s engine analyzers (or, more accurately, “upper level, engine management systems”) do just that. In IFR, especially in the “hard” stuff, you need to know if there’s a problem developing in your engine(s) and you need to know fast! I can’t imagine a pilot or aircraft in this scenario not having such a valuable tool—not just in the event of a problem, but in order to monitor engine “trending” by occasionally downloading information about engine condition. Not only can these new systems provide more accurate information then previous analog units, but with fuel prices where they are, they can provide pinpoint leaning data to maximize fuel burn and minimize the risk of engine damage from over-leaning. In the past, these were add-ons to the existing analog instruments that came with your airplane. Today, many are certified as “primary” replacements and solve the issue of panel space. You can either watch your EGT/CHT (Cylinder Head Temperature/Exhaust Gas Temperature) or you can just add one of these and know that all critical engine parameters are being monitored. You’ll be immediately notified if something changes and, unlike a co-pilot, they won’t fall asleep! Other than a 406 ELT, there is another item you might consider to complete a fully-equipped “hard” IFR panel. Unless the aircraft has dual EFIS systems wired to a separate and independent electrical buss, EFIS systems require back-up instruments. Often, the aircraft’s original attitude indicator (typically vacuum), analog airspeed, and altimeter are used, but this creates panel space issues. You could replace them with 2 1/8-inch instruments, but they’re expensive. Fortunately, two GA manufacturers offer an interesting alternative in the form of small EFIS-style back-up instruments. The “SAM” (Standby Attitude Module) from Mid-Continent Instruments and Avionics and L-3 Avionics Systems’ “Trilogy ESI” (Electronic Standby Instrument) both offer the back-up tools you need in a compact package. Both include battery back-up to protect you from an electrical/vacuum failure. So, if panel space is an issue and you’re considering the 2-inch analog alternative, these are worth checking out. Regardless of the type of flying you do, my “panel philosophy” remains consistent: Know your flying capability and equip your panel a notch ABOVE that capability. When the flying gets “hard,” you want to know what the airplane can do and what you need it to do. If you fly for business or just fly a lot of IFR with a destination and timeframe in mind, it’s a good chance your skills and equipment will be challenged. In my years as an avionics consultant, I’ve seen minimal changes in aircraft performance, but I have seen incredible improvements in the avionics tools available to IFR pilots. Nonetheless, even with an aircraft fully equipped with all the avionics tools we’ve discussed and a skilled pilot at the helm, there’s one more crucial ingredient that can’t be overlooked—good judgment. Remember, if you’re considering an upgrade that includes the addition of some or all of these avionics talk to a good avionics consultant and understand your options before you buy. Happy and Safe “Hard” IFR Flying!